Exploring the world one meal, and several drinks at a time. 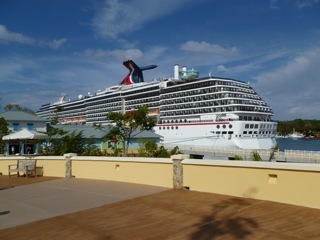 I just got done with a seven day cruise to the western Caribbean. Whenever I travel to a new location I try to take in the local food. I got to experience some good, some bad. I think it’s fair to say that I am willing to try out almost anything, including the iguana I had when I was on the island of Roatan, Honduras. Roatan is not a big island; it is off the coast of Honduras and is one of the better islands in Central America. The island is breathtaking and for the most part it is a clean city, unlike Belize where garbage piles up on the side of the road and the smell is unbearable at times. I just got done parasailing off the west side of the island when my tour guide, Carlos, told me about the local cuisine. He said most eat fish, but since the island has an over population of iguana, some hunt and eat this good source of protein. Hunting season happens in April, May and June. It is hard to believe that iguana is an island delicacy. The lizards, which are huge, are everywhere. They usually just hang out by the docks and soak up the sun. How do you hunt iguana? It is a two-man operation, and it involves a dog that is trained to sniff out the lizard. Iguanas usually hang out in trees; the trained dog will find a scent and will bark-up the tree when it finds one. The hunter then shakes the tree violently until one falls out. The dog then grabs it, gently, and the hunter takes it back home. The lizard isn’t killed until it is ready to be cooked. You aren’t supposed to keep an iguana for more than seven days, unless you want to keep one as a pet. The female is prized because of her eggs, which is also consumed. The tour guide told me the best spots to get cooked iguana are from vendors on the side of the road. As we are zipping down the two lane road, none of the local street vendors were out selling the prepared lizard. I was truly disappointed, when Carlos told the driver to pull over. He ran to a small restaurant in downtown Roatan and told us to follow him. I had about ten people from my cruise ship along on this tour. When I told them what I wanted to try, many of them also decided to try it too. We walked into a small restaurant; the floor had no carpet and was just concrete. The walls were painted in bright tropical color. It was still early and the two lonely tables, along with one painting on the wall were the only signs that this place was still open for business. Carlos went to the upstairs apartment, where the owners of the shop lived. She came down and greeted up with a big smile. Her kitchen was small, two burning stoves and a refrigerator that you would find in an American home. The preparation took about 15 minutes. 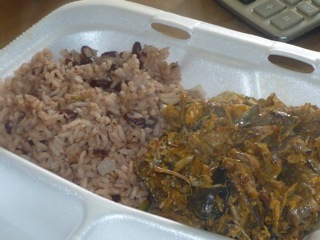 The iguana was flash fried and served with beans and rice. The cook also made some plantains. Now a warning, if you are an iguana lover, stop reading now. If you truly want good iguana, you can tell if it is prepared properly because it will come with some of the iguana’s eggs. My dish had two. I was pretty excited to see what my meal would look like and taste like. I opened the to-go box and was taken off-guard. I expected it took look a little more appetizing. It looked like a mangled mess of scales, meat and bones. The eggs looked like the yokes of a chicken’s eggs, but more oval in shape. I dug in and took my first bite, hoping it would taste like chicken. Needless to say, I can’t describe the taste. The lizards on the island don’t eat meat because they are mostly vegetarians, which I hoped would give it a more pleasant taste. I tried a second bite, trying to see if I could find a distinguishing flavor. It didn’t have a gamey taste, but more of a fishy taste to it. The iguana was covered in a jerk spice and cooked in coconut oil. I passed the to-go box to my fellow travelers. Many took at least one bite. I tried again, to see if I could find any unique flavor. What surprised me were all the bones in the dish; I can’t imagine a young child eating this for dinner. I nearly barfed on the iguana egg. I learned after taking a bite that you are supposed to take the egg sac off before eating; it is a lesson that I will not forget. The egg was a pale yellow color and flavor was unappetizing. The egg sac was chewy and void of flavor. After swallowing part of my first bite, I spit it out. I wish I had water to wash away the nasty flavor. I can safely say that all you iguana lovers out there have nothing to worry about when I get home. I don’t plan of eating this dish again anytime soon. I am sorry your experience was unpleasant. Mine was remarkably different. On a recent visit to Tela, Honduras, (I returned at 5am this morning) a local family discovered I had never eaten Iguana. It was purchased by a local vendor, $15.00. It is a staggering figure for the locals; 300 Lipitas! My traveling companion’s uncle broke the iguanas necks with the back of a machete and laid the open fire. Then his wife roasted the Iguanas in the open fire to char the skin while Tio sharpened the small knife. When the skins were all charred Tia peeled the skin off the animals in a circular angled motion. It was amazing! Then Tia gutted the animals. We had one male and one female so Tia showed us the reproductive parts. The carcasses were beheaded and well rinsed in rain water that everyone collects. The remaining flesh was cut into 6 inch sections then rinsed several more times with bitter orange. Tia explained this gets rid of the contamination. We learned later that means the bad flavors. Then she boiled the meat in filtered water and garlic briefly. While it cooked we all took turns grating coconuts on a 2 foot by 2 foot mounded grater. (Tia can grate coconuts two handed. Tio can grate until the coconut is a tiny sliver.) The coconut meat was kneaded with some filtered water then drained, then the process repeated. The iguana meat was drained, cooled then broken up into tiny pieces with the bone left in. Then the all the meat was evenly distributed in a pot and covered with the fresh coconut cream. Several local spices were added and the pot was returned to the heat. While it finished cooking rice and plantains were prepared to serve along side. The following day Tia made fresh fluffy flour tortillas and breadfruit fries. In both dishes I found the iguana bony but meaty and delicate. It doesn’t taste like chicken but it is of the same texture. I love iguana but I don’t think asking a restaurant to make as quickly as possible was a good idea. Iguana takes cleaning, patience and someone who cares about your experience like my traveling companion’s Tia.